The intricate and colorful mosaic components of a Charlene Reano necklace create wearable art that is a touchstone to the Southwest for visitors and locals alike. Charlene Sanchez Reano and her husband Frank collaborate to create designs combining the traditional materials of Pueblo people with contemporary motifs. Using shell, turquoise and other stones, the two create innovative Santo Domingo mosaic jewelry in vivid colors and varied textures. 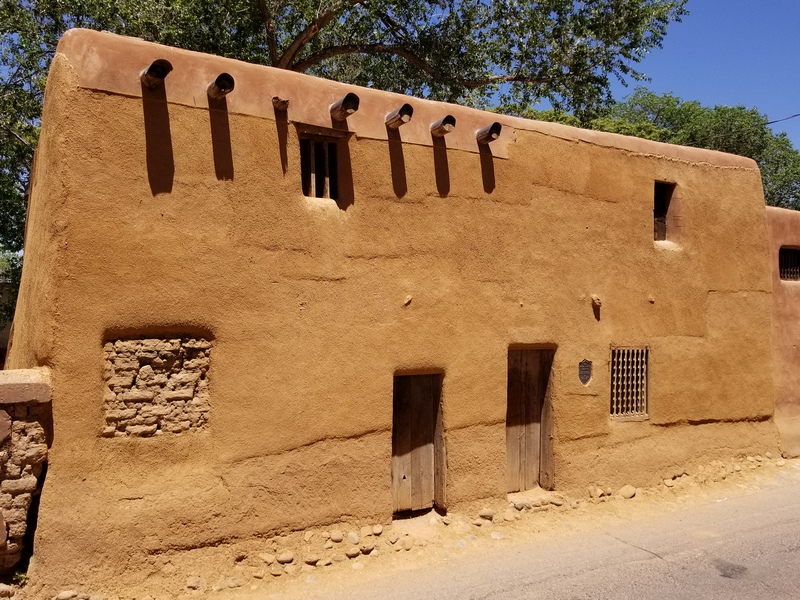 “Charlene Reano’s pieces are a prime example of those touchstones to a moment or an experience that spark the imagination.” says Rick Smith, owner of the Oldest House Indian Shop in Santa Fe. Frank comes from a Santo Domingo Pueblo family of jewelers and grew up learning the craft. Charlene is from San Felipe Pueblo. After studying at Highlands University in Las Vegas, NM, she cut and set stones for gold and silver inlay at a jewelry manufacturing company in Albuquerque. 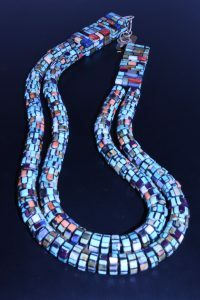 Her sister-in-law Angie Reano, who is credited with reviving mosaic inlay among Santo Domingo jewelers, taught Charlene her craft, and she and Frank began making jewelry in the 1980s. With Frank grinding the shell and doing the silverwork, Charlene creates, designs and cuts the tiny, fragile stones to form the multitude of mosaics that go into each piece. 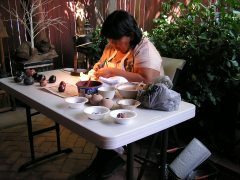 See Charlene Reano’s beautiful jewelry at Oldest House Indian Shop at 215 East De Vargas Street in Santa Fe. The shop offers a diverse array of Native American and Western collectibles.